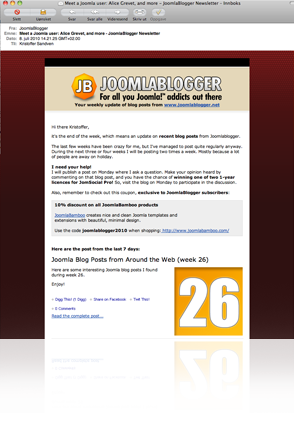 To keep track of what's going on here at JoomlaBlogger, the best way is to subscribe to my mailing list. The ebook contains the most popular posts from this blog, in one convenient PDF file. At least two as soon as you sign up! with additional information on selected subjects - exclusive to JoomlaBlogger subscribers! Also, you will receive an occasional special newsletter with content written exclusively for my subscribers. I'm a 6th grade teacher in Phoenix, Arizona and am starting my own educational blog. I love your website! Thank you for helping us newbies discover the world of open source through Joomla! You are just incredible. I personally appreciate your love towards Joomla. 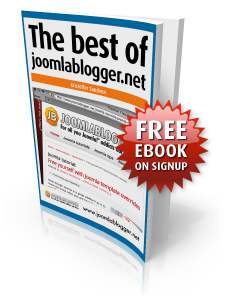 I think currently you are one of the best Professional Joomla Blogger of the world. I have to pay my respect for your incredible site and job you are doing. You are offering to the community and this is great! Thank you very much for your offer to produce articles regarding problems that we might face with Joomla. I would like to thank you for all the great work on your site and newsletter. It is a great resource and reference.